My son is learning to play the recorder in music class. I thought the plastic case it came in was not all that aesthetically pleasing so I decided to weave him one on the inkle loom. Came out great IMHO. He likes it too and told me that it was a little annoying today because everyone kept touching it and it was embarrassing. I think that is high praise from a bunch of nine year olds. Chalk one up for mom! Looking for a used, good condition and in working order, well maintained Brother 965 or 970 knitting machine - please contact me. Thank you! Big pile of fleecey goodness. 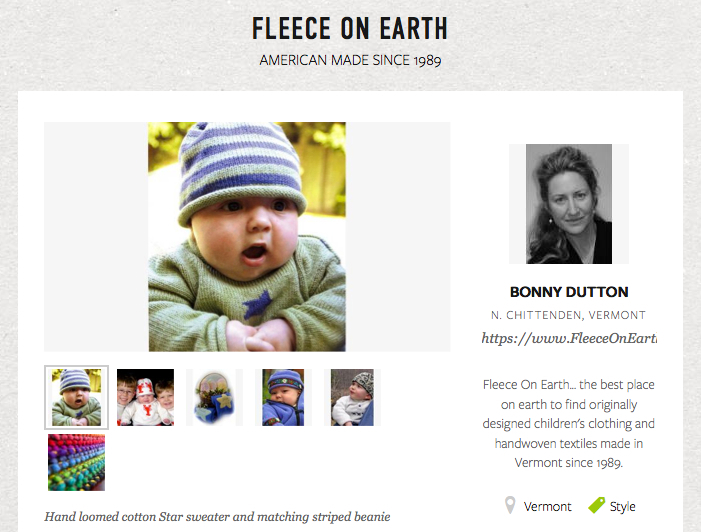 More of our popular Pom Pom hats and Helga Jackets ready for the store tomorrow. We had a pretty heavy frost/freeze here in VT last night but covering flowers and tender veggies will hopefully extend the growing season a while longer. 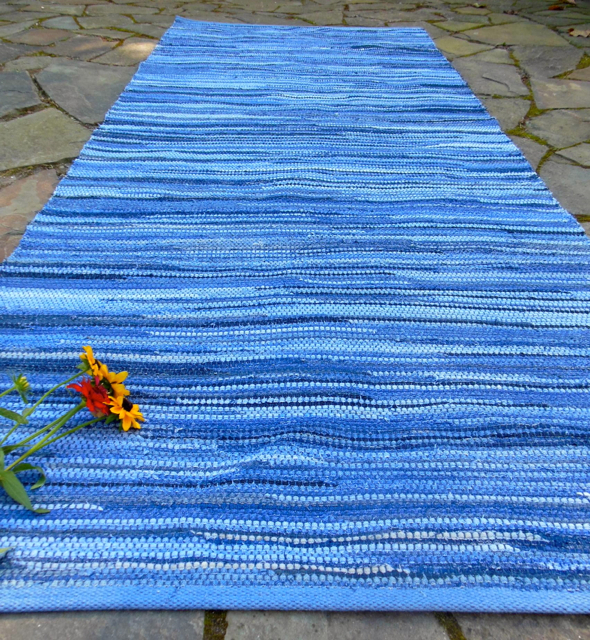 Speaking of growing - the denim rug order grew over the last few weeks until weaving was completed this morning and I was able to take her off the loom. Here she is in all her denim splendidness. 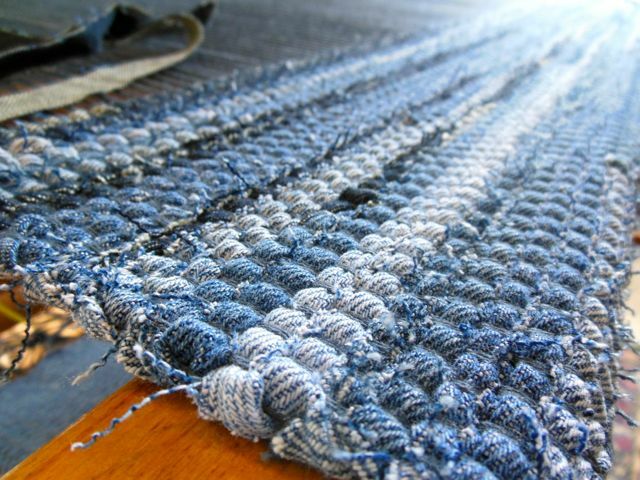 Such a treat to see how the finished cloth looks when it rolls off the storage beam. 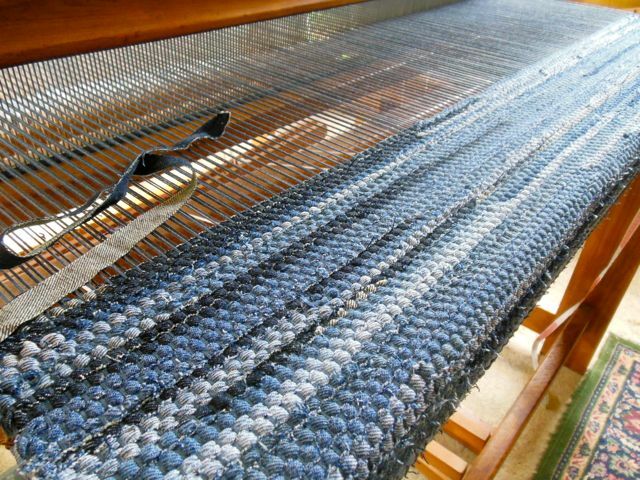 Will get a final measurement once it has time to relax now that it isn't under loom tension anymore. Love the different shades of indigo. 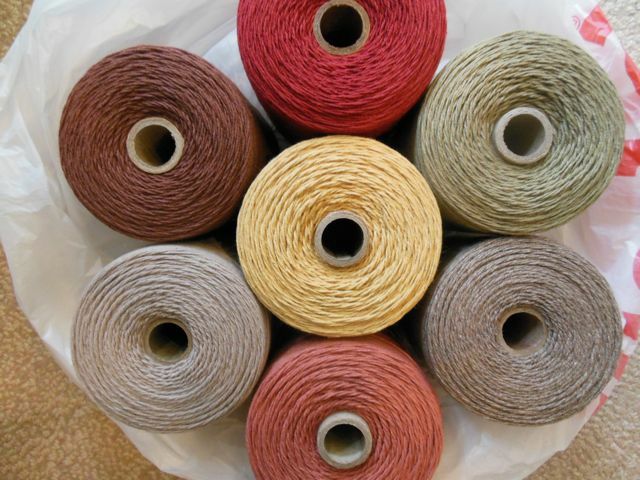 Choosing colours for a new rug warp. 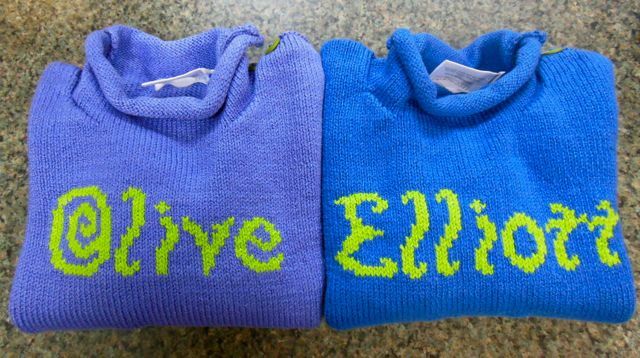 A couple of "What's My Name" sweaters ready to ship out to twins Olive & Elliott. 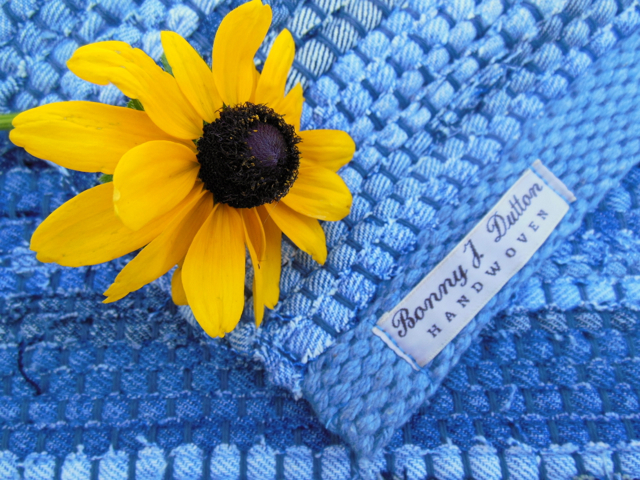 Will be adding this new product to the website soon. 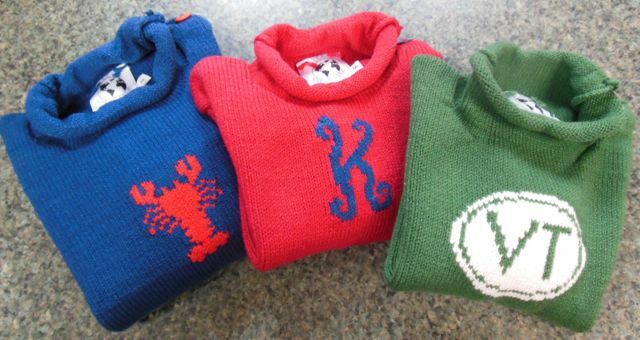 More sweater orders heading out the door. Stocking up the shop with our most sweetie-pie item. 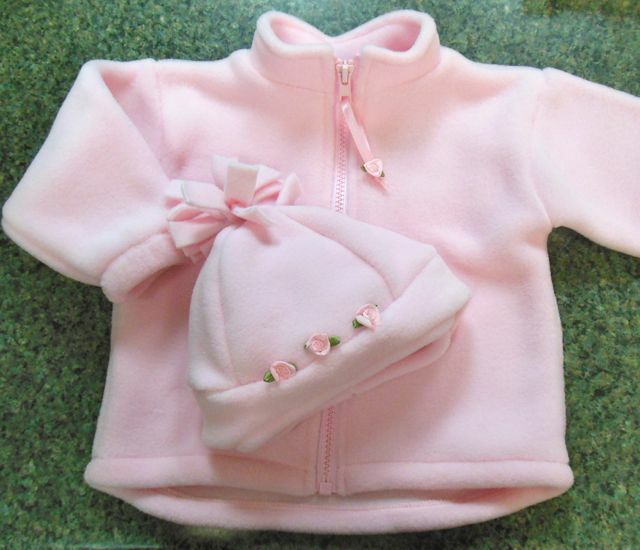 "Rosebud jacket" and "Rosebud Pom Pom cap". Just passed 500 votes! 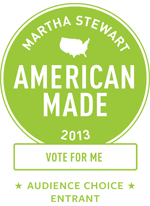 Thanks to all who are voting for us in the Martha Stewart American Made contest! Remember you have 6 votes every 24hrs thru Sept. 13. Don't forget to vote again today! It's easy to register and then you can cast 6 votes every 24 hours thru Sept 13th. I'd appreciate your support! Thanks ever so much! 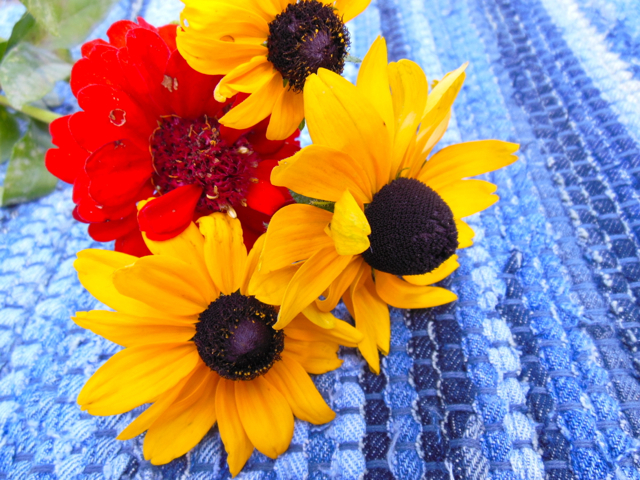 Today I was able to thread and start weaving a denim rag rug order. Love this old Villa Handcrafts loom. I learn something new about her every time I work on a different project. 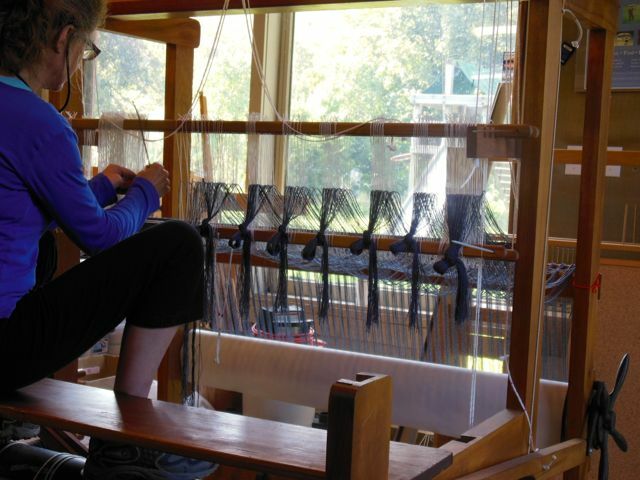 Today I figured out the best way (for now) to position myself for threading and sleying. Beautiful old maple and great craftsmanship. A joy and a pleasure to work on.